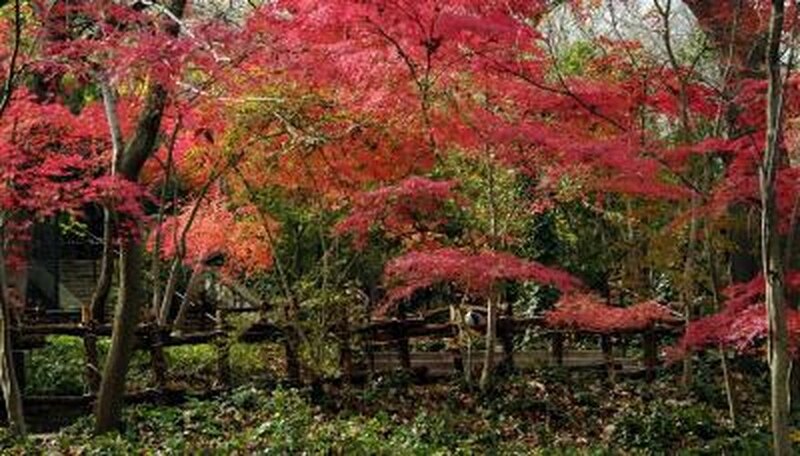 Japanese maple (Acer palmatum) is a small, sturdy ornamental tree, but ice, snow, wind or falling objects can break its branches. You can sometimes save a broken branch if it is not torn all the way through the cambium, which carries water and nutrients to the leaves. Find and treat damaged branches within an hour or two. Otherwise, the only solution is pruning. Note the location of the break. If the limb is broken at the root collar, where the branch meets the trunk, you can't save it. Cut the remainder of the branch cleanly with a pair of long-handled pruning shears, leaving an angled stub that will let moisture drain off. If the branch is broken farther out from the root collar, examine the leaves at the end of the branch. If they are wilted, chances are you didn't notice the damage in time. Remove the entire branch as in Step 1. If the leaves are not yet wilted, examine the break itself. If some of the cambium and outer bark is still intact and wet, quickly lift the branch level to close the wound. Wrap it tightly with electrical or duct tape to keep moisture out and seal the wound. Create a sling for the end of the branch to take stress off the wounded area while it heals. Run a length of rope under the end of the branch, about 2 feet from the tip. Tie it to a branch above. Watch the leaves on the broken limb over the next days and weeks. If leaves curl and die, remove the sling and prune off the branch as in Step 1. If leaves survive, remove the tape after 6 to 8 weeks, and remove the sling after 6 months.